COLUMBIA, S.C. (WOLO) – Continued severe winter weather conditions have negatively affected American Red Cross blood donations, more than doubling the number of canceled blood drives. 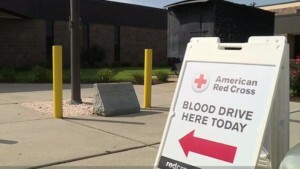 As a result, Tuesday, the Red Cross issued an emergency call for blood and platelet donors. Nationwide, the organization said more than 550 drives were cancelled in January, resulting in more than 16,500 blood and platelet donations to go uncollected through last week. In South Carolina, 25 drives were cancelled this month. Beyond the inclement weather, frigid temperatures and the flu have caused low turnout. Regardless of the weather, the Red Cross needs to collect more than 13,000 blood and platelet donations every day to meet patient needs. Accident victims and patients with cancer, sickle cell disease, blood disorders and other sicknesses depend on the supply of blood and platelets. You can make an appointment to give simply by downloading the free Red Cross Blood Donor App, heading to their website or calling 1-800-RED CROSS. 1/23/2018: 9 a.m. – 3 p.m., Lexington Medical Center Irmo, 7035 St. Andrews Rd. 2/9/2018: 8:30 a.m. – 2:30 p.m., Gilbert High School, 840 Main St.
1/24/2018: 1 p.m. – 5 p.m., Midway Elementary School, 180 Midway Dr.
2/12/2018: 2 p.m. – 7 p.m., Red Bank United Methodist, 2909 Old Barnwell Rd. 1/25/2018: 8:30 a.m. – 2:30 p.m., Airport High School, 1315 Boston Ave.
2/1/2018: 8:30 a.m. – 4:30 p.m., Lexington Medical Center, 2720 Sunset Blvd. 1/27/2018: 9 a.m. – 2 p.m., Mt Olive Lutheran Church, 1541 Lake Murray Blvd. 1/25/2018: 2 p.m. – 7 p.m., Grace Baptist Church, 219 West Calhoun St.